North Koreans, they’re just like us! By which I mean they love smartphone games about war. And according to North Korean state media, the people of that isolated country have three new war-themed smartphone games to choose from. First spotted in English-language media by NK News, the new games are titled Confrontation War, Guardian, and Goguryeo Battlefield. And while the Goguryeo game is historical, focusing on the period between 57 BC and 668 AD, the other two are set in present day, as nuclear tensions increase between North Korea and the United States. North Korea’s state-run media outlet Arirang-Meari reported today that the new games have, “become popular among youth students and workers” and are enjoyable for their “rugged confrontation with the enemy.” You can probably guess who North Korea considers the enemy. 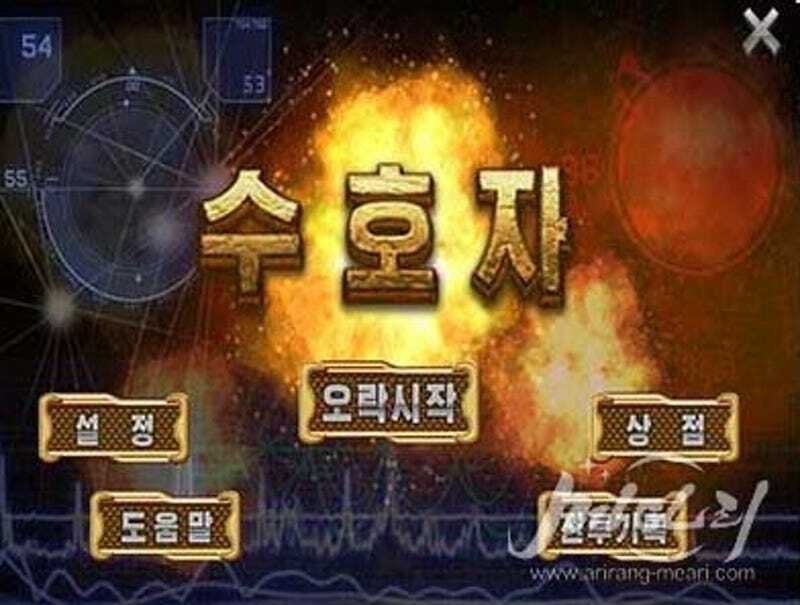 Arirang-Meari doesn’t give a description for Confrontation War, but judging by the name and the explosion on the Start screen (the screenshot for the game is the top image on this post), things go boom. It’s estimated that roughly 3 million of North Korea’s 25 million citizens own a smartphone, and that number is growing. Most of the phones are developed in China, though North Korea does have its own smartphone industry. As Gizmodo’s own Adam Clark Estes recently pointed out, North Korea’s latest phone, the Jindallae 3, looks an awful lot like an iPhone. The country also makes computing products that clearly take inspiration from American companies. And while they don’t necessarily bear any resemblance all the time, it’s clear where they often get the name. North Korea even has an iPad, though you’d never mistake it for the one made by Apple. There aren’t reliable numbers on the North Korean mobile gaming market, but with limited options for distraction and a small but growing number of phones in the hands of the country’s elites, you can bet that many people are downloading the games to play-act destruction of the Yankee Imperialist Dogs at their doorstep. Or whatever the Kim regime is calling Americans these days. North Koreans may not have personalities like Arnold Schwarzenegger to sell them games, but like I said, they’re just like us. And if that doesn’t scare you about the prospect of nuclear war started by our two idiot leaders, Kim Jong-un and Donald J. Trump, then nothing will.